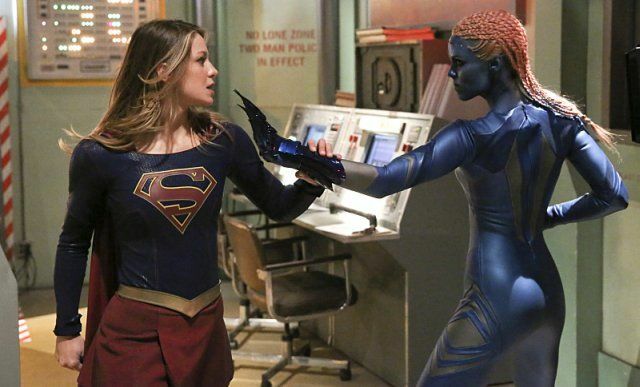 With Kara unwilling to work with the DEO in the wake of her aunt's death and Winn drafted by them to help fight a dangerous alien hacker with technopathic abilities, Kara and James must journey to the Fortress of Solitude to see answers on how to fight the creature known as Indigo. But will their working together strike the final blow to James' relationship with Lucy Lane? The Outsiders comics of Judd Winick (the character of Indigo/Brainiac 8), All-Star Superman (the key to the Fortress of Solitude being made of a heavy material only Superman or another Kryptonian could lift), The X-Men movies (Indigo's appearance here bares more resemblance to the make-up design for Mystique than her appearance in the original comics) and Superman: The Movie (the interior design of The Fortress of Solitude and the sequence in which Kara must race to stop a missile is a tribute to Superman doing the same thing in the movie). Granting that hypocrisy from Cat Grant is hardly unusual and that - given the events of 108 she would feel some sympathy for the victims of a hacker making private information public - it still seems odd that Cat was preaching the importance of always reporting the truth to James last week yet this week she's throwing out a gift-wrapped list of powerful people who make use of a website catering to married people who wish to cheat on their spouses because nobody will care about the scandal! Jeremy Jordan has suffered a lot on this show, particularly in recent episodes. It almost seemed like the writers weren't sure to do with Winn now that he can no longer pine after Kara . This episode proves a welcome change, as Winn gets to not only save the day by being a more capable hacker than anyone else at the DEO but he gets a nice little subplot where he tries to be nice to evil queen in training Siobhan Smythe. Laura Vandervoort's performance as Indigo is interesting, to put it mildly. There's a cattiness to the performance that doesn't fit what I was expecting when I heard what character she was playing... and yet I rather like the idea of a rogue Brainiac in a female robot body playing the femme fatale instead of the usual cool, dispassionate Coluan. It's a little cheesy but it's fun. The scene in which Alex confesses to killing Astra and J'onn lying to cover for her ends with some wonderful non-verbal acting on the part of Melissa Benoist and David Harewood, as Kara just hugs Alex, J'onn tries to leave the room to give them some privacy and Kara just reaches out and grabs his arm before taking his hand and squeezing it. It's a wonderful yet silent acknowledgement of the relationship between the three. Once again, the best scenes of the episode are any scene in which Melissa Benoist and Mehcad Brooks get to play off each other. The two have a great natural chemistry and it is a real treat seeing them at work. The script this week is unusually smart, answering all the logical questions this show usually glosses over as I ask them, such as why Jimmy Olsen knows more about The Fortress of Solitude than Supergirl does. The final action sequence - with Kara trying to bring down the rocket charging toward National City - is easily the best the show has seen to date. The symbol seen on the screen of Kara's rocket when it reawakens in The Phantom Zone - three circles forming a point-down equilateral triangle - is the symbol of Brainiac in the comics. Indigo later refers to this symbol as the sign of her people - the font of omniscient knowledge. The truck which nearly hits the car that Supergirl saves has a license plate which reads PLASTINO. This is a nod to artist Al Plastino, who not only co-created Supergirl but also co-created Brainiac. James offers to take Lucy out to dinner at Noonan's so they can have some time alone together outside of work. This may be an ironic nod to Noonan's Sleazy Bar - the favorite watering hole of super-powered assassin Tommy "Hitman" Monaghan in the comic Hitman. In the comics, Indigo first appeared in the Titans/Young Justice: Graduation Day #1 special. Created in an uncertain future era, she traveled back in time to the early 21st century and arrived severely damaged. She attempted to heal herself by bonding with other electronic life-forms, causing tremendous damage in the process and indirectly killing two Titans. Once it was determined that she was no longer dangerous, she was later adopted into the new Outsiders team, formed by Nightwing and Arsenal. It was later revealed that Indigo was really Brainiac 8 - the granddaughter of the future Brainiac 6 and that her sweet, innocent personality was a cover for a murderous android akin to the other Brainiacs. She was destroyed, resurrected again later as part of Superboy Prime's Legion of Doom, and destroyed again. The DCTVU version of Indigo was once known as Brainiac 8 and was once linked to The Great Colun Cyber Construct. She was a descendant of the Brainiac clan. She was captured while trying to shut down Krypton's planetary defense system in order to kill everyone on the planet. She was also considered the most dangerous criminal ever sent to Fort Rozz. Laura Vandervoort, the actress who plays Indigo, played Supergirl on Smallville. Indigo's species is identified as Coluan - a highly intelligent, blue-skinned race from the planet Colu. They severed as super-computers on Krypton, responsible for running day to day operations. In the comics, Coluans are a highly-intelligent green-skinned race from the planet Colu. Though considered cool and machine-like by other species, they are not a mechanical race. The key to The Fortress of Solitude is made of a million tons of condensed dwarf star and is so heavy that only Superman and a few other select beings - including Supergirl - are capable of lifting it. This is a nod to the mini-series All-Star Superman, where Superman replaced the original key - a gigantic arrow disguised as a directional marker - with one made of dwarf star material. The DCTVU version of the key is a compromise between the two designs from the comics. It doesn't look like a normal house key, unlike the version from All-Star Superman. Instead, it is an rod-shaped device, not unlike an over-sized arrow, with the House of El symbol engraved on one side. The Fortress interior contains a statue of two figures holding a globe. The globe is Krypton and the two figures are Superman's parents, Jor-El and Lara Lor-Van. There are a number of display cases inside the main room of The Fortress. One of them contains the rocket which brought Superman to Earth. Another display case contains a Legion Flight Ring - the rings used to denote membership in the 30th Century superhero team The Legion of Superheroes, of which Superman was a member in the comics when he traveled forward in time as Superboy. Kara identifies the robotic helper in The Fortress of Solitude as Kelex. This was also the name of the robotic butler who tended to The Fortress in John Byrne's Man of Steel mini-series. Winn determines that Indigo created an oscillating variable matrix to cover her footprints. Winn creates an inversion pathway to track Indigo down. Winn knows more about Python 6 malware encryption than anyone at the DEO. According to James, the key to the Fortress of Solitude is made of a million tons of condensed dwarf star. Alex: Kara, Hank was only doing his duty, okay? Protecting the planet, just like you do, every day! Alex: But soldiers do. When they have to. And Hank had to. J'onn: As effective as kicking and punching is, next time you're angry about something... lets have coffee. Cat: Toyman Junior? You're the computer expert. Fix this. Winn: (After Cat has left the room) I definitely liked it better when she did not know who I was. Indigo: To think... I was once linked to The Great Colun Cyber Construct. And now I wander the same realm as Candy Crush. James: Think we should run this by Director Henshaw? James: Kara, I know you're upset with him for what he did. I would be too! But that doesn't mean you have to fight this alone. Kara; I'm not alone. I'm with you. Kara: I miss Winn and Alex. I save the world better when I save it with people. James: Well, you ARE saving it with me. Indigo: I am invincible! I am a god! Winn: No. You're just a glorified Windows Vista! Kara prefers crullers to powdered donuts. Cat refers to her own recent run-in with having her secrets exposed to the press by hackers in 108. Supergirl flies faster than Superman, according to Jimmy Olsen. James Olsen knows the location of The Fortress of Solitude and has been there several times. Kara had never visited The Fortress of Solitude before, though Clark did invite her several times. She was afraid it would remind her of Krypton and make her feel homesick. Despite this, the Kelex robot in The Fortress of Solitude are programmed to respond to Kara's commands. A different Kelex robot appeared in Kara's dreams of Krypton in 113. When James asks her about it, she says they were commonplace on Krypton. The Coulans are identified as a highly intelligent, blue-skinned race from the planet Colu. They severed as super-computers on Krypton, responsible for running day to day operations. Kara tells Lucy the story James told her about how his father gave him his first camera as a gift before dying in combat from 107. It turned out that Lucy had never heard that story before. Fort Pemberton holds the closest nuclear missile silo to National City. Indigo was the one responsible for reactivating Kara's ship and linking it to Fort Rozz so both could escape The Phantom Zone. Winn hooks up with Siobhan, apparently making-out (or possibly more) in an elevator. Lucy dumps James, thinking he is in love with Kara and knowing, from Kara's words, that she's in love with him. Alex confesses to killing Astra. Kara forgives her. At the episode's end, Non retrieves the pieces of Indigo's body. The opening flashback takes place in The Phantom Zone, 13 years ago. Possibly the best episode of the series to date. There's nothing tacked on and Laura Vandervoort turns Indigo into a gloriously memorable (if somewhat hammy) villain. Would that they'd given her a more memorable design (seriously, are they TRYING to provoke a lawsuit from Jennifer Lawerence and Fox?!) but the whole thing is so fun, smartly-written and well-acted you can forgive them.